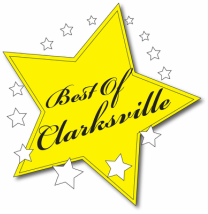 The Best of Clarksville offers three donation options for businesses to sponsor: Presenting, Gold and Silver. The detailed information for each option is listed to the left below. If you would like to be a sponsor, please complete the information to the right below. Do you have questions about making a donation as a sponsor? Click here to contact the board!